...a lot of walking around Annapolis. It's very threatening and hail is forecast. But that won't dim our fun! We got here around 11 pm last night, high off of our #Bruins win!!! We boosted Grace into the beautiful antique bed in Mary's guest room and went to sleep. Now we're eating delicious pecan rolls and taking turns showering. Mary really is a great hostess. The best part is that because Mary is an honorary McInnis sister, I don't have to wear the wig in front of her. I wore it into the house last night, but Jennifer poked fun at me "I thought she was one of us?" So I got to take it off. Whew. I wear it to shield people, but I don't like it. We will still get to visit the Naval Institute, but it doesn't look like we'll be strolling downtown. Then this evening we head for the Arlington Westin for all the Milblog Conference festivites! Jen, Grace & I are leaving shortly for our DC weekend. Thinking about this was an important diversion while I was in the hospital. I planned it over and over. There will be more events than I will be able to attend. And I might have to leave some earlier than I want to. There is going to be a visit to the US Naval Institute; the Naval Institute's Annual meeting; a visit to the Pentagon; a fabulous cocktail party at the Navy Memorial; and "ta-da"...the MILBLOG conference! In the next five days I will get to see lots of friends starting with Mary Ripley....the honorary fourth McInnis sister. Whatever happens this weekend - I am so happy to be at this point in my recovery. Great! Now I Am In Trouble. The B's just lost. So now it goes to Game 7. Tomorrow. When Jen, Grace & I are driving to DC. If we don't find somewhere on the road to watch it......I am dead. 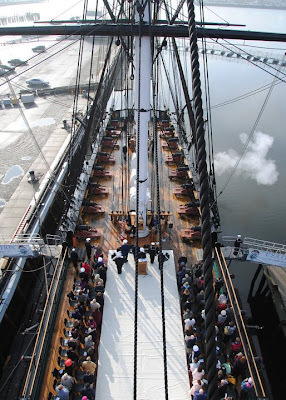 Looks like it was a beautiful service this morning aboard Old Ironsides. Wish i had been able to make it. That's what Grace, Jen and I have been calling it. After a lot of procrastonation on my part and an abortive attempt last Monday......we finally made it into Images Boutique in the Yawkey Center for Outpatient Care last Wednesday. It's part of the MGH complex and a hop, skip & a jump from the house. Grace & Jen were there for their opinions and as a distraction. I needed to do this, but I would have kept putting it off. You know....it's reality. Images is on the 9th floor, higher than the parking garage next door. It looks up at Beacon Hill, but I couldn't quite enjoy it. The biggest kick in the pants is that Blue Cross has no preferred provider. That means I pay $400 upfront & wait 30 days for reimbursement. So I tried on wigs. Long & short. Dark & light. Now the problem is that I have been bald so long...they all looked fake. But we picked one. It's ready. If we pick it up tomorrow, it will be "Wig Wednesday - The Sequal"
I'm not here because life is a little chaotic. I am putting most of my time into being ready for the Milblog in two weeks. Although it is ironic that of all the years I have blogged on Navy things.......this year has been the lowest point. I still read stuff, not as much as I want, but certainly more than I write about. Dr. Miller assures me that my "cognitive deficits" will resolve themselves. And I do believe him, they did before. And I am being patient, I know it will take longer this time. I know I can't compare four months of Revlimid back in '08 to what I have endured since August. In the past I would often compose posts in my head as I went to sleep. Then I would wake up and write them. I still compose them as I fall asleep.....but they are gone in the morning! In the morning it's all about remembering which pills when. I have to remind myself to eat because I am rarely hungry. Fortunately, my father yells up to me at least once a day, but sometimes it takes a headache to remind me to eat. Also, this is a period of somewhat conflicting physical realities. They are telling me to push myself physically and work my way back from the last several months of laying around. Great, sure.....I am doing a little walking, I am doing a little yoga. But this is also a time (after the 50 day mark) when they expect me to feel more weak and tired then just before the 50 day mark. Geez! So I am paying more attention to eating and walking. Doesn't mean I don't miss you all, ok? I had a great night's sleep, we think it was all the sunshine yesterday. We ate outside at East Bay and then we sat out in Jen's back yard. Then I got up in time for the other Jen to visit. Then I ate the other half of my lunch from East Bay. Then we went for a walk around the Nook. We watched "Waiting For Superman". Great documentary, utterly depressing. And all day I tortured both Grace and Jennifer! Among other things I made them watch Rebecca Black's "Friday". We're trying to decide what to do about dinner. Thursday at my appointment we talked about the problems I am having with sleep. My body is all confused with my sleeping around the clock, lack of schedule and exercise, etc. So Kate reels off a bunch of solutions about good sleep hygiene. I must pay attention because I am stuck staring at the ceiling for two and three hours trying to fall asleep. I have never had this problem. I was so good at falling asleep that if it were an Olympic event even the East German judges would have given me high marks. I have fallen asleep in cars, trains, at the movies, in the middle of conversations....it was effortless. So Kate asked if I blogged in bed. Before I could answer Jennifer piped right up - "Oh yes!" Of course I blog in bed! Mary Ripley referred to the laptop as my lover because I told her that since I began chemo it's been on the other pillow every night. So the laptop was banished to the first floor. Yesterday I didn't even check email because I was too tired to go down there. Now today, when I was packing to come down to Jen's, my Dad asked me to leave it so he could look for something online. He knows Jen has multiple computers. I have not been separated from the laptop for more than a few hours since I got it. Jennifer wants Grace and I to come to her house for the weekend. We were telling my parents about it today when Jen brought me back from Dr. Miller's office - good reports all around at this check up. So my father looks at Jennifer and says "Take her now!" They came to our parents house and took me over to Grace's. Dave's away and all the kids are out. So it's just us. Grace loves "Cops".....Jen & I just fume about all the people who have their civil rights violated. We just sit her and yell "Lawyer! Lawyer!" Then Grace wanted us to watch "Alaska State Troopers" but she can't find it in her bazillion channels. She's looking for something for us....and Jen is demanding that Grace fork over the clicker. So.......I am here, at the computer. LOL! 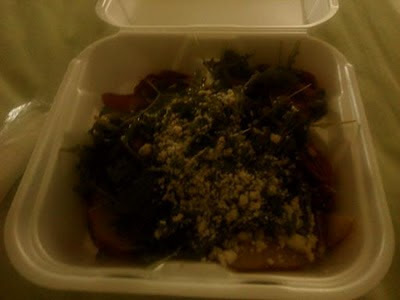 My parents brought salad home from their weekly Warren Tavern lunch. Arugula & Pear Salad - Great Hill blue cheese, candied pecans & lemon vinaigrette. Happy Day #50 to me!